Your AT&T Office@Hand Desktop App by default is integrated with your phone contacts. You will be able to view your personal contacts through your AT&T Office@Hand Desktop App. To synchronize your Outlook contacts, follow the steps below. With the AT&T Office@Hand Desktop App, you are able to synchronize your Outlook Contacts so that you can easily call them or send an SMS to the number that they have on file. For the Outlook plugin and View Outlook contacts, toggle the switch to ON. Note: Once the Outlook Plugin is enabled, please restart Outlook. 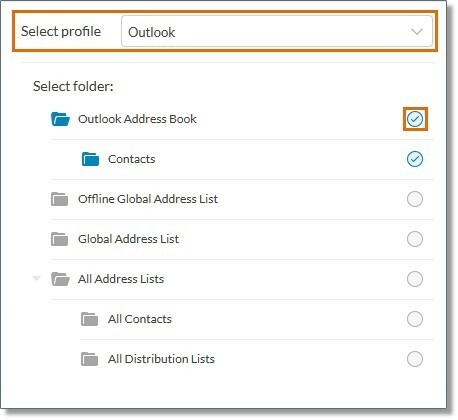 For Select profile, select Outlook and click on the folder of the contact list that you want to be synchronized. The AT&T Office@Hand Desktop App should automatically import the photos from your Outlook Contacts upon syncing.